A novel flight instrumentation kit that will revolutionise testing and evaluation was today officially handed over to the Royal Australian Air Force (RAAF). The handover occurred during SCINDICATE 2018, DST's open day for industry in Melbourne. Minister for Defence, the Hon Christopher Pyne MP, said the DST conceived Non-Intrusive Flight Test Instrumentation (NIFTI) would bring great benefit to RAAF. "Conventional flight tests can be costly and involve extended periods of downtime for aircraft to be modified and fitted with various test instruments," Minister Pyne said. "This state-of-the-art wireless system has the ability to carry out in-flight tests without the need for time-consuming aircraft modifications." NIFTI comprises a single recorder with multiple sensors that can be attached to most internal and external aircraft surfaces to check operational conditions. 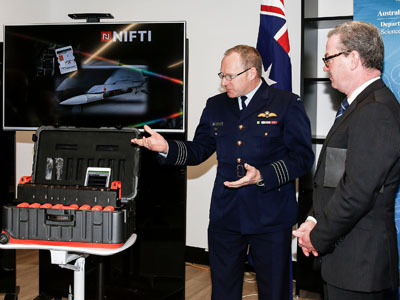 "In trials NIFTI has reduced flight test instrumentation down-time from months to days with significant cost savings to be achieved," Minister Pyne said. "This is another impressive example of an innovative technology transitioning to Defence capability." NIFTI was conceived by DST in collaboration with RAAF and developed by Australian SME Defence Innovations for operational use.